Editor's notes: Ouyang Ziyuan, academician at China Academy of Sciences and chief scientist of China's moon exploration project, talked with China Daily's Ma Chao about Chang'e 1, the first spacecraft sent by China to the lunar orbit as well as the future of China's exploration of the moon. CD: Between October 2007 and March of this year, the Chang'e 1 spacecraft circled the moon for nearly 18 months. As chief scientist, what do you think has been achieved with Chang'e 1? And what has the spacecraft meant to the future of China's moon exploration project? Ouyang: Though China's moon exploration project began much later than other countries, it is at the cutting-edge in several aspects and is unique in many ways without excessive expenditures of money. The Chang'e 1 has successfully achieved four scientific targets. The first was to formulate a two-dimensional as well as a three-dimensional map of the entire moon. We have now formulated a two-dimensional map encompassing the surface of the entire moon without any omissions. It is a high-quality map and is available to anyone in the world. The Chang'e 1 scanned the moon's surface with three laser beams, measuring the height or altitude of more than 9 million points on the moon. Based on our data, a stereoscopic map will be accomplished before the end of this year. The second target is to explore the composition of the moon's surface and minerals it contains. Using instruments of remote sensing, the Chang'e 1 has obtained data of the allocation of chemical elements, as well as types of minerals and stones on the surface. We are currently processing the data and working to draw a geological map of the moon. The third mission is to explore the soil layer on the moon, a pioneering work that has not been done by any other country. The Chang'e 1, using microwave technology, measured the depth of the soil layer across the moon. One focus of the soil examination is to detect how much helium-3, a crucial element for nuclear fusion, is on the moon. Since the fossil energy on Earth might be exhausted in a century or less, we have to find an alternative energy source. Nuclear fusion would be an important option. There is an abundance of helium-3, perhaps millions of tons on the moon, which could be used to generate energy once the technology matures. The moon might fundamentally change the pattern of energy generation for humans. Last but not least, the Chang'e 1 was commissioned to probe and record the environment on the moon, such as its electromagnetic features and solar wind, which are crucial for future landings. Within these four aspects, an enormous amount of data has been collected. Before Chang'e 1, Chinese scientists had to depend on data from foreign countries. Now we have original data. In line with the international convention, Chinese scientists will study the data collected by Chang'e 1 for a year and then release the data to the world. The Chang'e 1 is the first step in China's moon exploration project. The second step would be landing on the moon, i.e. sending a lunar lander and a lunar rover onto the moon's surface. The third step would be not only landing but also returning part of the landing apparatus with collected samples back to Earth. Only after all these steps are successfully accomplished, will it be possible to carry out a manned moon landing. CD: When will Chinese astronauts be able to land on the moon? Ouyang: This is what many are very eager to know. There are many speculations on when China can achieve this feat. The India media have claimed that China will be able to land its astronauts on the moon in 2024. Michael Griffin, former administrator of NASA, said China will be able to achieve a manned moon landing in 2020. Chinese scientists have many dates, too, such as 2020, 2025 or 2030. However, the State has not announced any specific schedule for the manned moon landing. CD: Is there then a schedule for landing the lunar rover? Ouyang: According to the State's plan, China's lunar rover will be carried by the Chang'e 3 spacecraft to the moon before the end of 2013. CD: You have mentioned the significance of moon exploration in relation to future energy supplies for mankind. In addition to this point, what can the exploration contribute to the economic development of China, and how will it affect the lives of ordinary people? Ouyang: The project will definitely advance our economy. For instance, the US' Project Apollo - which gathered around 400,000 people, about 20,000 firms and more than 200 universities - cost $25.6 billion. But it guided almost all the cutting-edge technologies in the 1960s and 70s, and has created an economic value amounting to 17 times the cost. Since China's exploration project has just been a few years old, it is still too early to measure the costs and benefits. But it has already helped many Chinese firms improve their product quality. Because the environment on the moon is extremely harsh and volatile, we have set strict criteria for our component suppliers. To meet the criteria, the suppliers had to spend a great deal of effort in research and development (R&D) and consequently improve the quality of their products as well as lower costs. 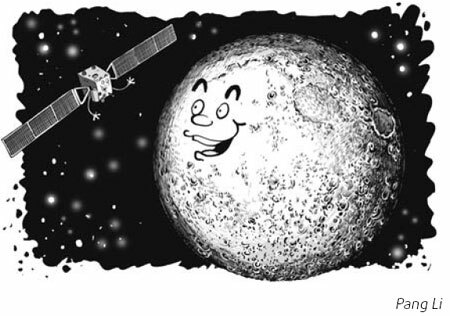 Another great benefit of the Chang'e 1 is the dissemination of knowledge about the moon and space. It spurs public interest in space exploration, and is a great opportunity to raise the scientific literacy among people. CD: Many countries, such as the US, Russia, India, and Japan, are planning to send astronauts to the moon, too. In comparison, where is the position of China in terms of technology? Ouyang: That is a tricky question, since it is impossible to evaluate exactly how big the gaps are, or to make an exact ranking. To say how many years a country is ahead or behind other countries is not scientific. What we know is that the US and Russia, with their advanced technology and rich experience, are definitely at the first tier. China, India and Japan all have distinguished features and special technological edges. Actually it is not wise to pay too much attention to who is superior to whom. I hope all countries could succeed in moon exploration and contribute to the understanding of the moon. CD: You have created a concept called "harmonious earth-moon relations." Could you please specify this concept? Ouyang: The moon has been a loyal guard of Earth for billions of years. It has inspired the philosophy, thoughts and aesthetics of mankind for thousands of years. With progress in moon exploration, the moon will become a great treasure to sustain the development of mankind. It will be an ideal transshipment station if people want to explore or even migrate to another planet. In the future, Earth and the moon can develop harmoniously together.